By December 1914, Germany, Britain, France, and other European nations had been fighting since August. Trenches were dug on the Western front in September and those trenches, now home to soldiers, meant a holiday that would be cold, wet, and miserable tinged with the constant threat of death. What was first thought of as a “great adventure” by many young men must have quickly turned into a harsh cold reality as the casualties rose. Then Christmas time approached, and something wonderful happened. Illustration: the “Illustrated London News” depiction of the WWI Christmas Truce of 1914: “British and German Soldiers Arm-in-Arm Exchanging Headgear: A Christmas Truce between Opposing Trenches.” The subcaption reads: “Saxons and Anglo-Saxons fraternising on the field of battle at the season of peace and goodwill: Officers and men from the German and British trenches meeting and greeting one another; a German officer photographing a group of foes and friends.” Credit: A. C. Michael; Wikimedia Commons. 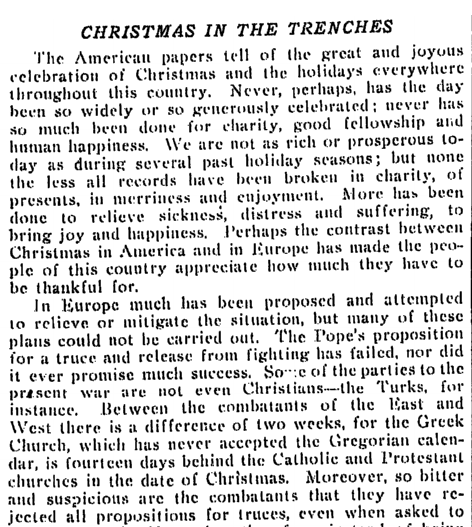 In an attempt to stop the fighting for Christmas that year, Pope Benedict called on the warring nations to declare a Christmas truce. Initially, Germany was reportedly agreeable to a truce – but only if the other countries agreed. 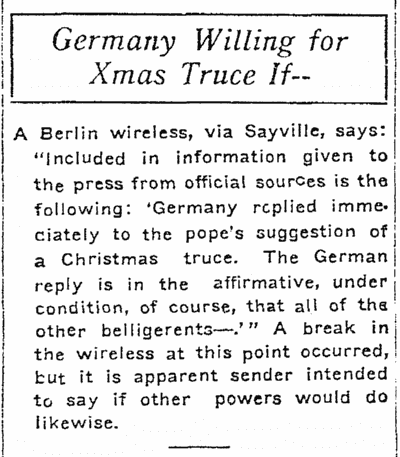 But not every country was in agreement about the Christmas truce, so the discussion of a lull in the fighting ended. 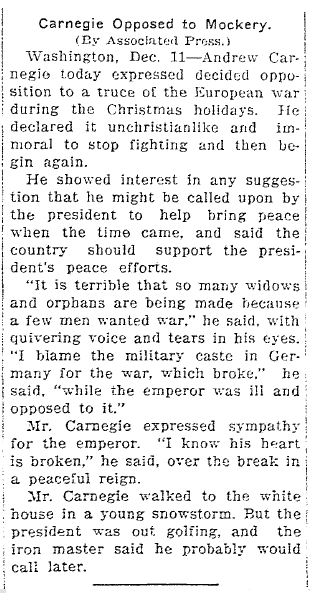 By mid-December 1914 the American newspapers announced that an official cease fire was not to be. 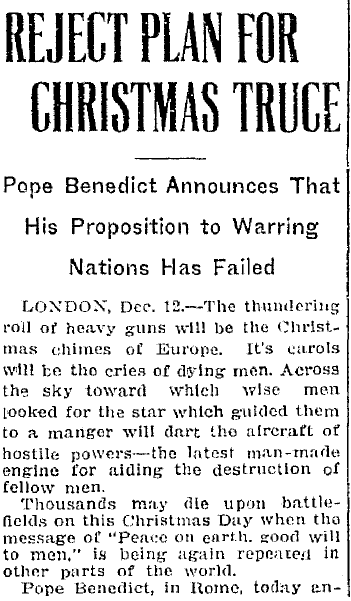 The thundering roll of heavy guns will be the Christmas chimes of Europe. It’s [sic] carols will be the cries of dying men. Across the sky toward which wise men looked for the star which guided them to a manger will dart the aircraft of hostile powers – the latest man-made engine for aiding the destruction of fellow men. Thousands may die upon battlefields on this Christmas Day when the message of ‘Peace on earth, good will to men,’ is being again repeated in other parts of the world. While an official truce did not occur, many WWI soldiers took matters into their own hands, setting aside their weapons and reaching out to their enemies in the spirit of the season. There were in fact mini truces all along the trenches that Christmas. While some mythology surrounds the details, there is no doubt that there was an unofficial cease fire, and soldiers from opposite sides did interact peacefully in “No Man’s Land” for Christmas 1914. Recollections of those involved told of gift giving, singing, kicking balls around, and other friendly interactions. 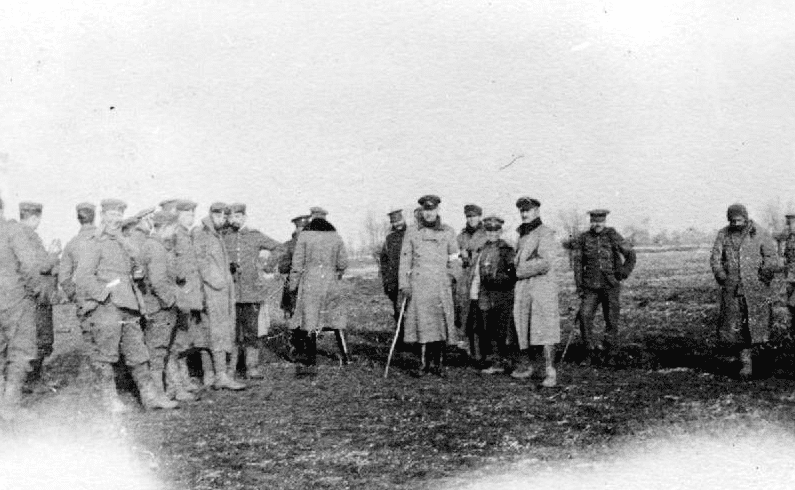 Photo: British and German troops meeting in No-Man’s Land during the WWI Christmas truce of 1914. Credit: Robson Harold B.; Wikimedia Commons. 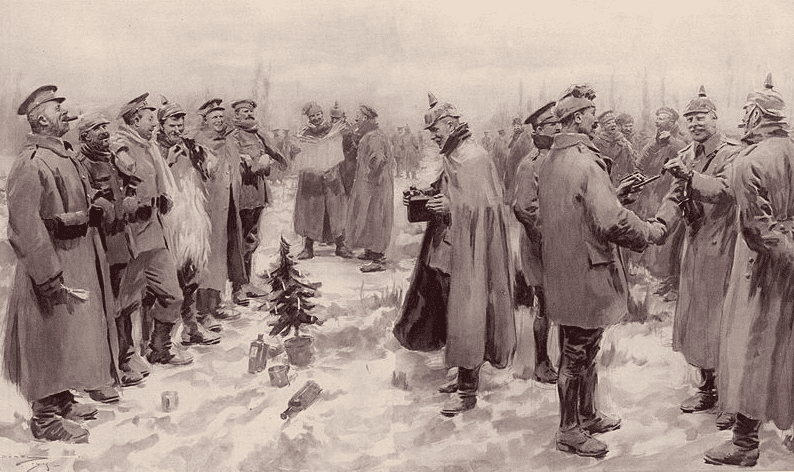 On Christmas morning two British soldiers, after signalling truce and good-fellowship from the perilous crown of their trench, walked across to the German line with a plate of mince pies and garniture and seasonable messages… and were sent back with packets of Christmas cards – quite sentimental – wreathed with mistletoe and holly, for distribution among their fellows. Initially American newspapers reported that an unofficial truce would be declared in the trenches so that the men could eat their Christmas dinners in peace. While those in charge were providing their fighting men with some small luxuries (reportedly the French government sent their soldiers champagne), an unofficial momentary truce was about all that these soldiers could hope for. Unfortunately, those fighting in World War I would see not only the Christmas of 1914 come and go with no peaceful solution to the war, but they would see three more Christmases bring fighting and lives lost – for some countries, almost wiping out an entire generation. But for a brief time, that December 1914, soldiers on both sides laid down their weapons and enjoyed a little “peace on earth,” if only just for a short while. 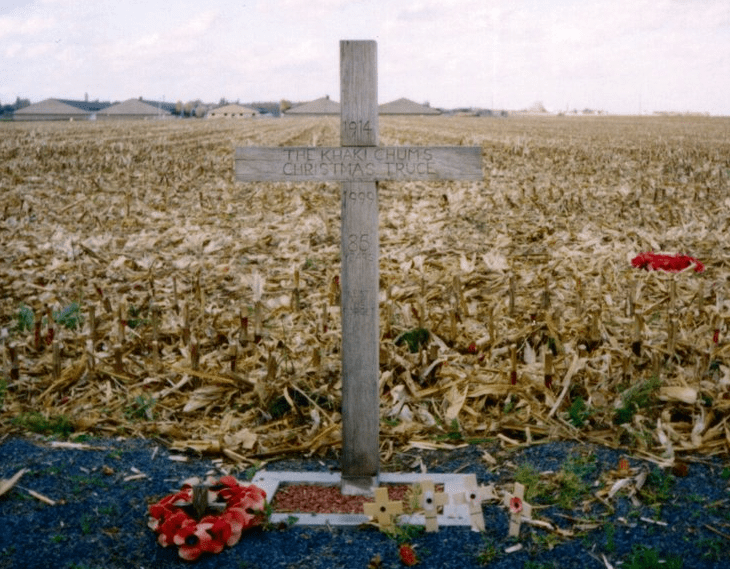 Photo: a cross erected in Belgium in 1999 to commemorate the WWI Christmas truce of 1914. The inscription reads: “1914 – The Khaki Chum’s Christmas Truce – 1999 – 85 Years – Lest We Forget.” Credit: Redvers; Wikimedia Commons. Various stories of the Christmas truce can be found in historical newspapers and online. A dramatic narration done by Walter Cronkite accompanied by the Mormon Tabernacle Choir tells the story of the World War I Christmas truce and can be found on YouTube here: https://www.youtube.com/watch?v=tRq–pTnlog.